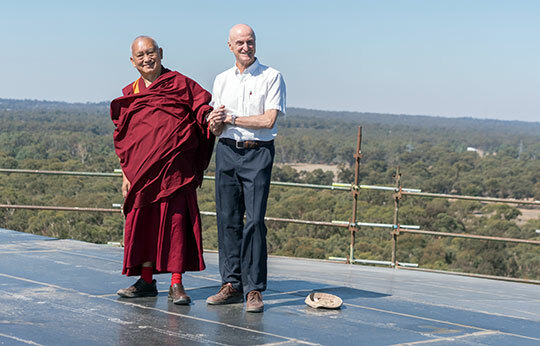 Lama Zopa Rinpoche with Ian Green, director, on top of the Great Stupa of Universal Compassion, Australia, April 2018. 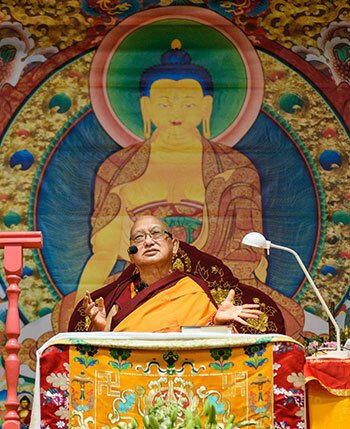 Lama Zopa Rinpoche is currently leading the continuation of the Bodhicaryavatara and Rinjung Gyatsa Retreat there. Photo by Ven. Lobsang Sherab. 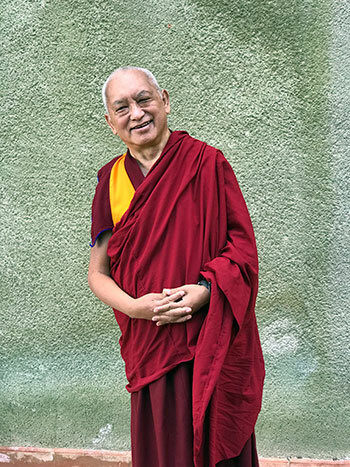 Lama Zopa Rinpoche’s schedule – a retreat postponed and new teachings added! Please note: Lama Zopa Rinpoche is giving the Most Secret Hayagriva initiation at Chenrezig Institute, Australia, on June 2–4. 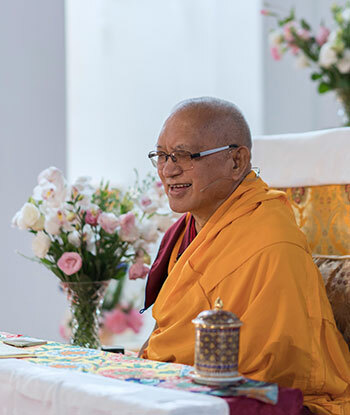 Rinpoche strongly encourages those students connected to the FPMT organization, particularly those who have responsibilities, to take this initiation. Lama Zopa Rinpoche giving a teaching at the Great Stupa of Universal Compassion, Bendigo, Australia, April 2018. Photo by Ven. Lobsang Sherab. The Method to Transform a Suffering Life into Happiness (Including Enlightenment) with Additional Practices, now available in ebook format. Students will also benefit from Lama Zopa Rinpoche’s commentary on the practice, now available in ebook format. A Daily Meditation on Shakyamuni Buddha, now available in ebook format, was specifically compiled by Lama Zopa Rinpoche for beginner Buddhist practitioners to use as the basis of a formal meditation practice. The King of Glorious Sutras called the Exalted Sublime Golden Light (the Sutra of Golden Light) is now available by print-on-demand. Reading the sutra helps bring peace to the world, promotes healing, gives great protection, and most importantly, plants the seed of enlightenment. The Holy Objects Fund offers grants toward the creation of holy objects for world peace. Funds for building large stupas, prayer wheels, Padmasambhava and Maitreya statues, and thangkas are disbursed around the world in alignment with Lama Zopa Rinpoche’s vast vision for the FPMT organization. Learn more about all the holy object projects for world peace supported by FPMT Charitable Projects and donate any amount so that these grants can continue. 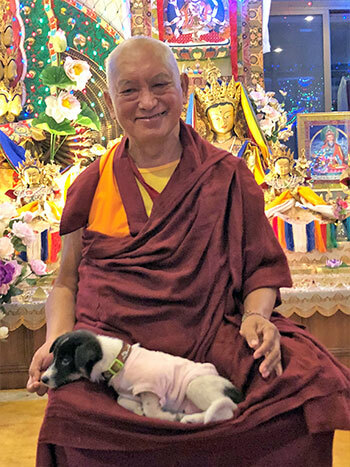 Lama Zopa Rinpoche with the puppy Tongnyi Nyingje, Nepal, December 2017. Photo by Ven. Roger Kunsang. Lama Zopa Rinpoche recently commented that he would like all new directors, spiritual program coordinators, study group coordinators, and registered teachers to read and keep remembering How to Make Your Life Most Beneficial for Sentient Beings, Even with Your Speech. This is also important for all currently offering service in these positions! You can find this text on Rinpoche’s Advice page and in the “Offering Service: Job Descriptions” section of the Affiliates Area. We’ve added the guideline: “Protecting the Geshe or Teacher and the Center” to the “Visiting Teachers” section to help your center carefully look after teachers and students. Lama Zopa Rinpoche at Centro Muni Gyana, Italy, November 2017. Photo by Ven. Roger Kunsang. Congratulations to Centro Tara Bianca, Italy, and the Service de traduction de la FPMT, France! 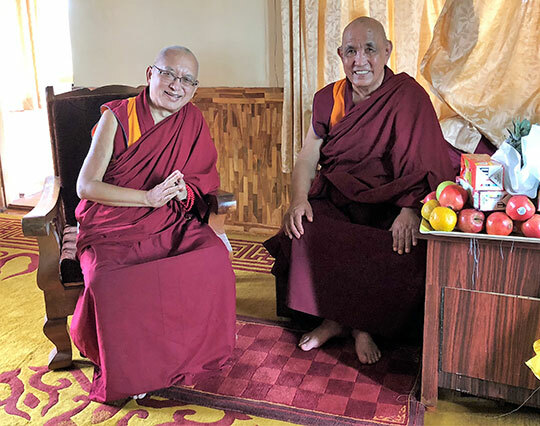 Both have completed their probationary period as FPMT study groups, have affiliated with FPMT Inc., and have become an FPMT center and service, respectively! 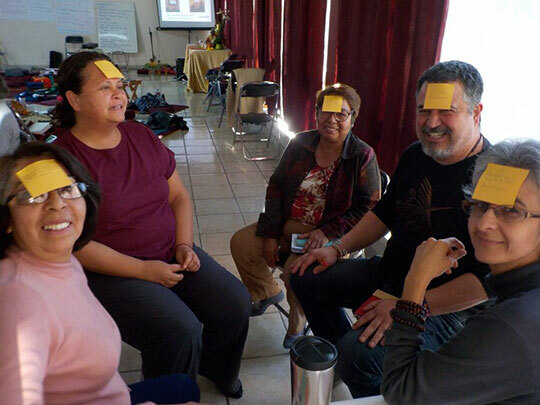 Foundation Service Seminar in Guadalajara, Mexico, February 2018. Photo courtesy of Gilda Urbina. FSS graduates who are teaching or planning to teach or lead introductory classes can book for the Teacher Development Service Seminar that follows the FSS at Jamyang Buddhist Centre this year! La méditation peut aider les enfants à trouver la paix et transformer les émotions négatives. Destiné aux parents et aux éducateurs pour méditer avec les enfants de 5 à 15 ans. Disponible auprès du Service de traduction de la FPMT au format papier ou ebook. Ganden Yiga Chozin, Pokhara, Nepal, has now become a satellite group of Kopan Monastery (with grateful thanks to outgoing director – Drolkar Court). Tsog Nyi Ling Study Group, Sweden, has become a satellite group of Yeshe Norbu Center.